The RadDataForm group headers appearance can be customized with the GroupHeaderStyle property of type DataFormGroupHeaderStyle. Background: Specifies the background of the group headers. BackgroundImageSource (ImageSource): Sets a background image for the group header. Foreground: Determines the group header text color. Height: Specifies the group header height. IsCollapsible: Indicates whether the group will be collapsible. Padding: Sets the group header content padding. TextAlignment: Specifies the group header text alignment. Here is an example that demonstrates how to style the data form group headers. 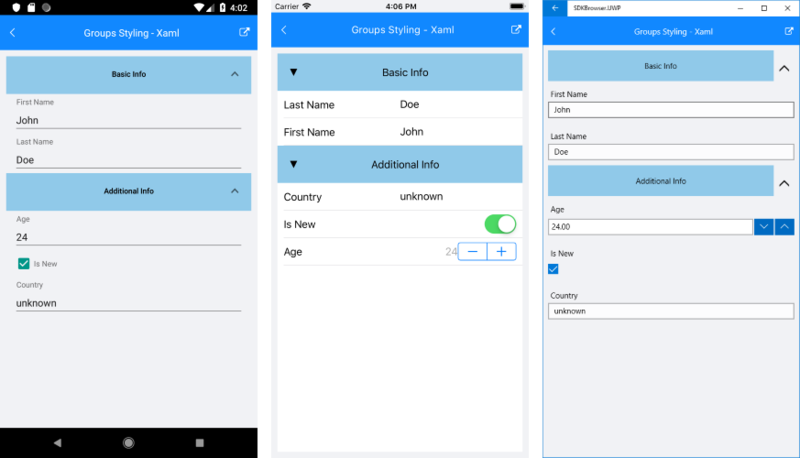 Sample examples demonstrating groups styling of DataForm control can be found inside the RadDataForm -> Styling section within the SDK Samples Browser application.